It's a shame that I learned about Selena by way of her death. The date was March 31, 1995 and I was where I was typically for a Friday night back then --- in front of the television watching the sitcom block, TGIF. (90's kids unite!) This wasn't a typical night of suburban teen shenanigans and gorging on green apple Sour Punch, as right in the middle of the broadcast a breaking news report sliced through my soapy little teen sitcom world. The headline was bold: Tejano Mexican-American singer by the name of Selena had been shot and was officially pronounced dead. My young eyes registered from the scenario playing on the screen that the shooting had taken place at a Corpus Christi Days Inn. The camera was focused on the hotel's sun-shaped sign it awash in the macabre glow of red and white lights. Yellow caution tape whipped in the sea wind behind the despondent news anchor. Since I was at the age where I believed my parents knew everything about everything and everybody, I yelled to my mother, "Some lady got shot...a singer...who is Selena?" My mother quickly came into the room, looked at the TV screen, and honestly said, "I have no idea...turn the channel and stop watching that terrible stuff." In later months and years, my hometown of San Antonio, Texas began announcing auditions for roles in the upcoming Gregory Nava-directed film about her life. A salon and boutique featuring fashions inspired by Selena's glamorous style was erected on the main strip into downtown. 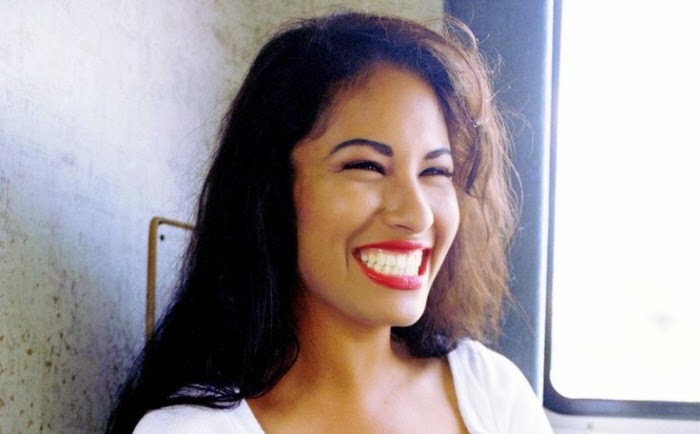 These were really just flourishes, because what really endured and impacted me the most was her music, and when local radio stations began playing her tunes at varying frequencies throughout the years, I began to cull together a full understanding of who Selena was and what she represented to a sector of people. Though impressionable I can be at times, I usually don't like aligning favored entertainers as role models because sometimes what you see is nothing but smoke and mirrors, yet, from a regarding standpoint, I understood why my friends considered Selena an inspirational figure and why her passing was much more than mere tragic incident. She was a charming and down-to-earth South Texas girl of Mexican heritage who had made a success of herself. She had broken down the barbed wire barrier that kept women from not being a present force in the mostly male-dominated Tejano music scene. She had turned a blind eye to the restrictions and stereotypes of what what was expected of her whilst putting a prodigious spin on the stuffy game plan of what a female singer was supposed to be, and she did it all within a short time frame and did it by being truly and wholly herself. Selena had broken down a partially opened door, gifting others the belief that they too could come through and that fact alone is impressive. I never sneer or chide something as important as that. Like Amy Winehouse and Jimi Hendrix, Selena was an artist that I wanted to hear more of and experience the evolution of their artistry. As the 1997 biopic illustrates, Selena was preparing to crossover into the mainstream to become the next Gloria Estefan. A sprinkling of songs, the soon-to-be hits, "I Could Fall In Love" and "Dreaming Of You", hinted that Selena was heading into a direction of a serious balladeer, with a R&B and pop lean that would slip her perfectly into a popular music market that is always in need of diversity. I sometimes play the 'What If?' game whenever I listen to Selena's first English language album, the unfinished Dreaming Of You. What if this single was released? What if she had done a massive US tour? What legendary artists would she have collaborated with? What type of sound would she have gone into in later years? Alternative soul? House? God forbid, EDM? It's wishful and indulging thinking, but when a life is ripped away so unexpectedly like hers was, you feel some kind of way about how that life could have panned out. Selena was often dubbed as the 'Mexican-American Madonna', but aside from her rocking those iconic bustiers with the 'little sprinkly things', I could hear more of the sultry gospel-tinged soul of Toni Braxton and Mariah Carey when "I'm Getting Used To You" and "Captive Heart" ease out. Her Southern belle upbringing was also present as her blues range showed up in songs like "Bibi-Bidi-Bom-Bom" and "Amor Prohibito", and the sultry purrs were several steps and skips away from the Cubano tropical perkiness of Estefan. A look at her stage presence reflected an attentive appreciation for Janet Jackson and her aesthetic, it all cached into every swerve of her lush curves and how she gracefully glided across the stage. With these elements, Selena would've been 'that' chick, 'that' diva, 'that' legend, heck, she already was. It's a shame that I learned about Selena by way of her death, but it would've been a far greater one if I hadn't learned of her at all. + Balia Esta Cumbia (Ven Conmigo, 1990) --- No South Texas wedding or Quinceañera is complete without this song. + La Carcacha (Entre a Mi Mundo, 1992) --- Unoooooo! Doooooosssss! Thresssssssssss! Cuatroooooo! ... yeah, I love that opening. + Dreaming Of You (Dreaming Of You, 1995) --- Because I want you to bawl your eyes out with me....this is the ending of the glorious Selena movie, starring Jennifer Lopez. "Dreaming Of You" was the perfect (and most heart shattering) musical eulogy to end the movie with. + I'm Getting Used To You (Dreaming Of You, 1995) --- Posthumously released this Diane Warren-penned number hinted at supreme promise. It's a great, misbegotten laid-back mid-tempo jam that perfectly blends Latin instrumentation with Selena's penchant to soulfully seduce. Just adore it. + Enamorada De Ti (Ven Conmigo, 1990) --- Where Selena got her New Jill on! + A Boy Like That (The Songs of West Side Story, 1995) --- The final song that Selena recorded was for a West Side Story tribute album that was mainly derived for a Los Angeles based AIDS benefit. Selena's New Jack blended Latin exercise is fiery, sultry, and makes the original sit on the sidelines. And if you couldn't tell...Sheila E. performs percussion on the track. + No Me Queda Mas (Amor Prohibido, 1994) --- That curled bang is chola-riffic. + I Could Fall In Love (Dreaming Of You, 1995) --- If I was forced to choose, this is my favorite Selena song. Hands down. + Missing My Baby (Entre a Mi Mundo, 1992) --- The Full Force remix of this is one of my favorite songs of the '90s.